Get faster to your favorite website, that's what Fast Dial Firefox Extension can make for you. You can make a bookmark through your browser bookmark, but Fast Dial prepares you with thumbnails that makes the appearance better and appealing. You can choose to open the web on the current tab, new tab or background tab. I like to use the background tab as the website will be loaded at the background tab while I can select another website. 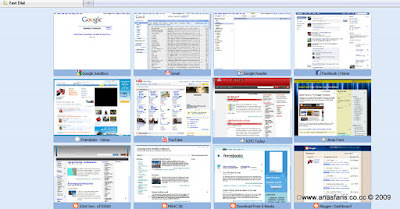 In addition, you can also change the theme of your Fast Dial for better appearance, just download the theme which is compiled zip folder from this site [Userlogos.org]. You don't need to unzip as you can just right click > preference > import and you import the zip file. anas, thx again 4 sharing, i love this thing especially when i start using google chrome, but then this appeared on firefox, i downloaded it quickly. again, thx!